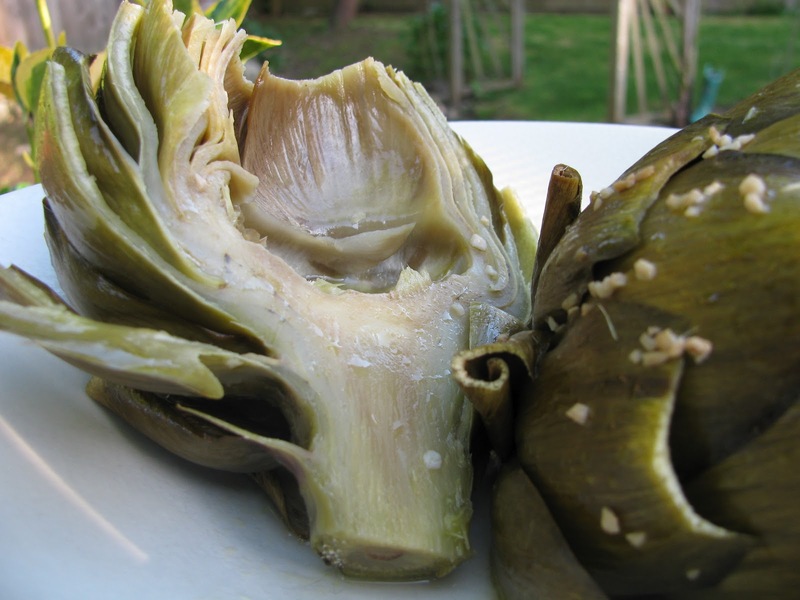 So since this month is artichoke month I started researching other ways to cook an artichoke, while still keeping it in its truest form. I knew I couldn’t steam it for a blog post because that’s a little boring, but what I did find was an EXCITING way to cook an artichoke while still keeping it plain and simple. You bake it. Yep. Get ready to get your mind blown. 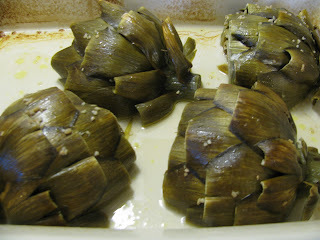 I’ll never steam an artichoke again. it's a little more prep on the front end but way easier to eat after it's cooked. Now if only I could invent a kitchen contraption that would do it all for me--I could be rich! Cut off about an inch at the top, trim the leaves, and cut in half. Use a spoon to hollow out the fuzzy hairs. For some reason this is the only picture I got of prepping the artichoke. I clearly need practice in being a food blogger. Now picture this artichoke cut in half, and the fuzzy hairs scooped out. Ok? Good, let's move on. Combine Artichoke Rub ingredients in a small bowl and mix together. Prep your artichokes. 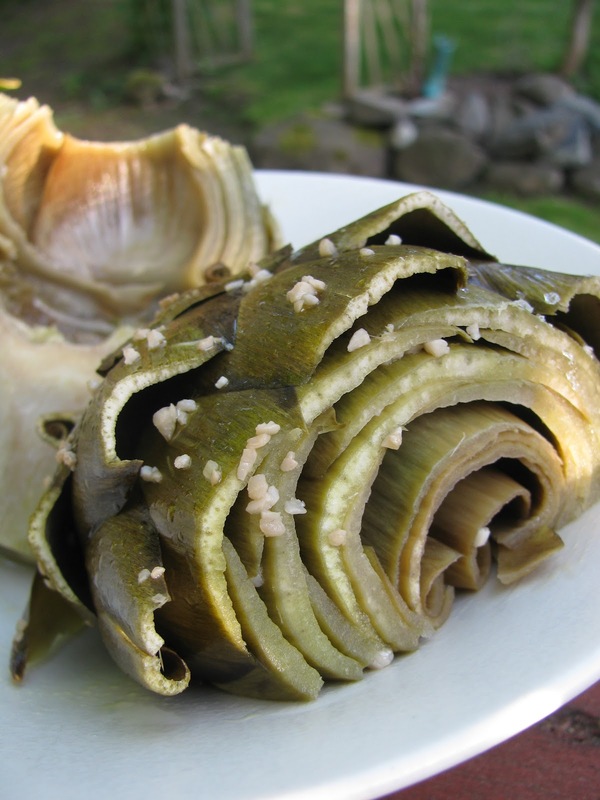 Smother your prepped artichokes in artichoke rub (get all up in that artichoke) and place them face down in a casserole dish. It is important that you make the rub prior to prepping your 'chokes so that you can rub them immediately after you've cut them. The lemon in the rub will keep them from browning. After placing your artichokes face down in the casserole dish, pour in the chicken or veggie broth and cover with a lid (tin foil will do). Bake at 350 degrees for about an hour and a half (may be less, just check them after an hour. You’ll know they are done when the outer leaves are soft and edible). Another angle. Work it, girl! This picture makes me want to bite my screen. This was the best artichoke I have ever had in my life. My husband was able to eat his so fast (no dipping!) 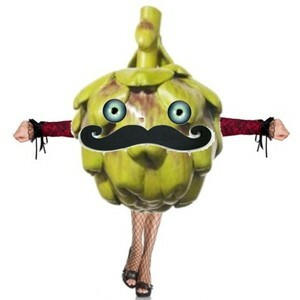 I swear he could have won an artichoke eating contest. We each had an entire artichoke to ourselves, no problem. Kids didn’t want to try them but that was fine by me; I didn’t push it. 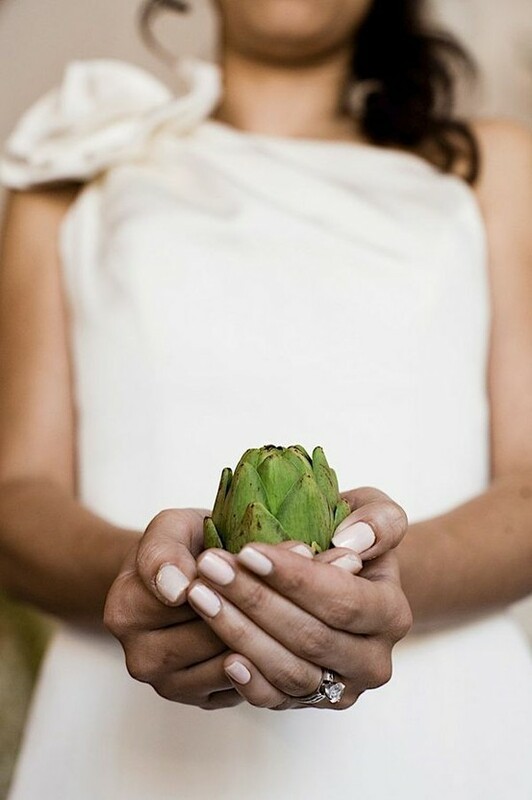 Come here, little baby artichoke and let me pose with you as if you were a precious egg on my wedding day. I don't know, guys. 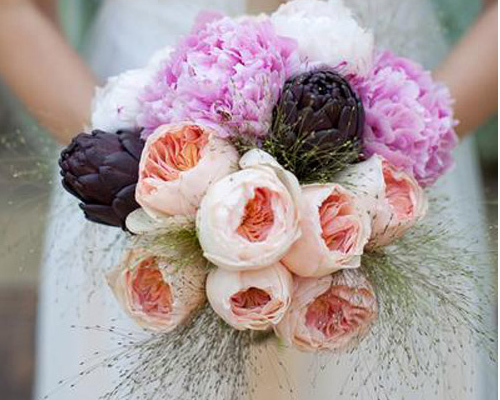 Just because it's on pinterest doesn't mean it's a good idea. Just sayin'. Freaking hilarious! I did want to bite my screen, for real. And omg, really, the bouquet? No. Not okay. 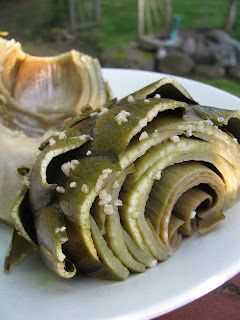 I'm so glad you posted this new option for cooking artichokes, it really does look so good that no dip is necessary. Awesome post Amber! 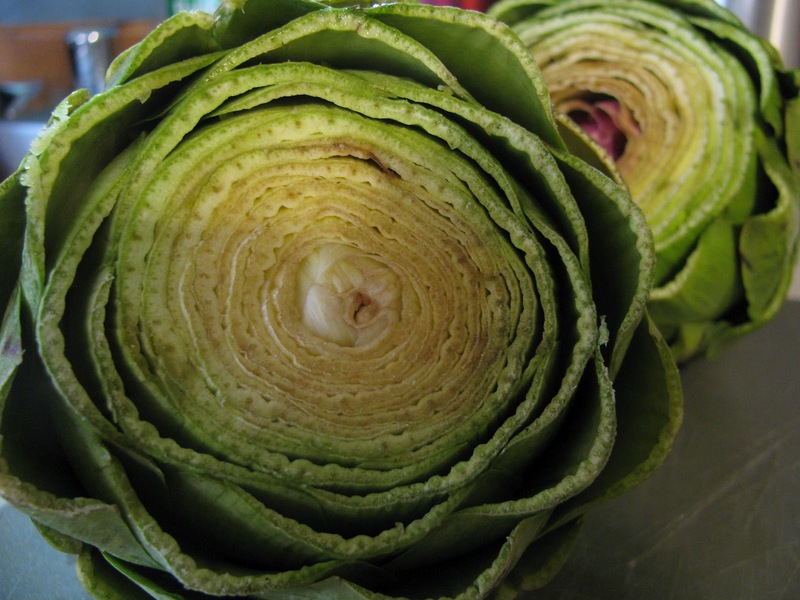 "Now picture this artichoke cut in half, and the fuzzy hairs scooped out. Ok? Good, let's move on." Loved it. Never had artichokes cooked this way. Now I'm dying to try it! This is brilliant. Goodbye steaming, hell-o baking! And why didn't I think of incorporating artichokes into my wedding day photos? WHY? Yay Amy! So glad we converted you. I will never go back to boiling either. I'm going to try this tonight! 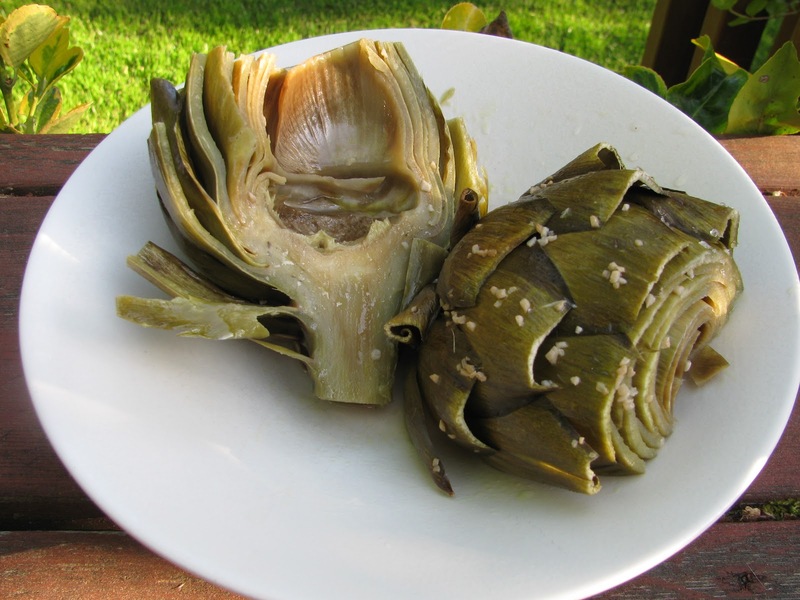 I tried this artichoke recipe and it was delicious! I forwarded your blog pot to a bunch of other artichoke lovers I know! 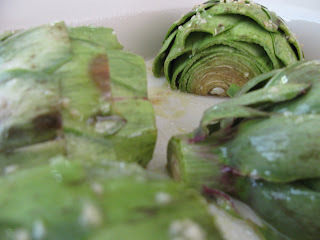 I can't wait to try this, but when you say add the broth, you don't say how much -- to the top of the artichokes? or just part way up?